Oath of the Horatii • Joe Forkan 2006-2010 Oil on Linen 72" x 40"
David’s Oath of the Horatii was the painting that initially inspired the Lebowski Cycle, for reasons I explained in my first post on the series. It was also the first one I started painting after I planned the series and stretched all the canvases, so it has undergone a lot of changes in the four years it’s been on and off the easel. I’ll post more about the process soon, but wanted to get this up on the blog. 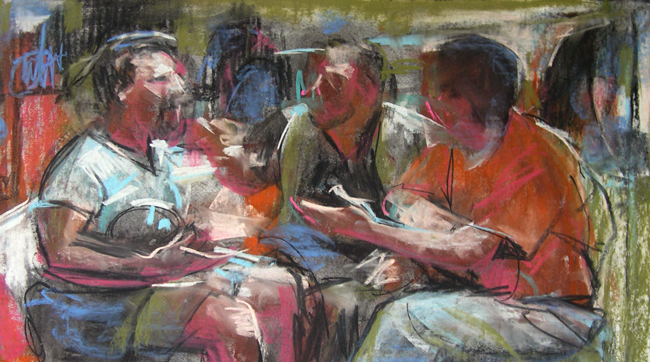 Below is an early sketch playing with the rhythms of the compostion, and the overall palette of the painting. This entry was posted in Uncategorized and tagged allegory, contemporary, figurative painting, Jacques-Louis David, neoclassical, painting, The Big Lebowski, The Dude, The Oath of the Horatii, • The Lebowski Cycle on August 5, 2010 by Joe Forkan. It was great to see Jeff Bridges win the Best Actor Oscar last night for his performance in Crazy Heart, 38 years after his first nomination. I’ve always enjoyed his performances, but my appreciation for his acting has certainly grown since watching The Big Lebowski innumerable times while working on The Lebowski Cycle. 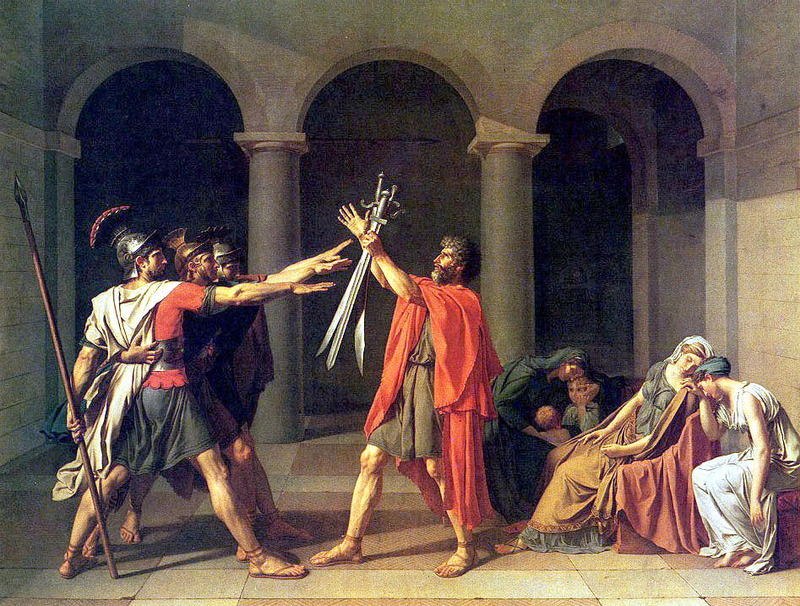 The image above is a detail from The Oath of the Horatii, based on the Jacques-Louis David painting of the same name. The full painting is almost complete and I’ll be posting it soon. 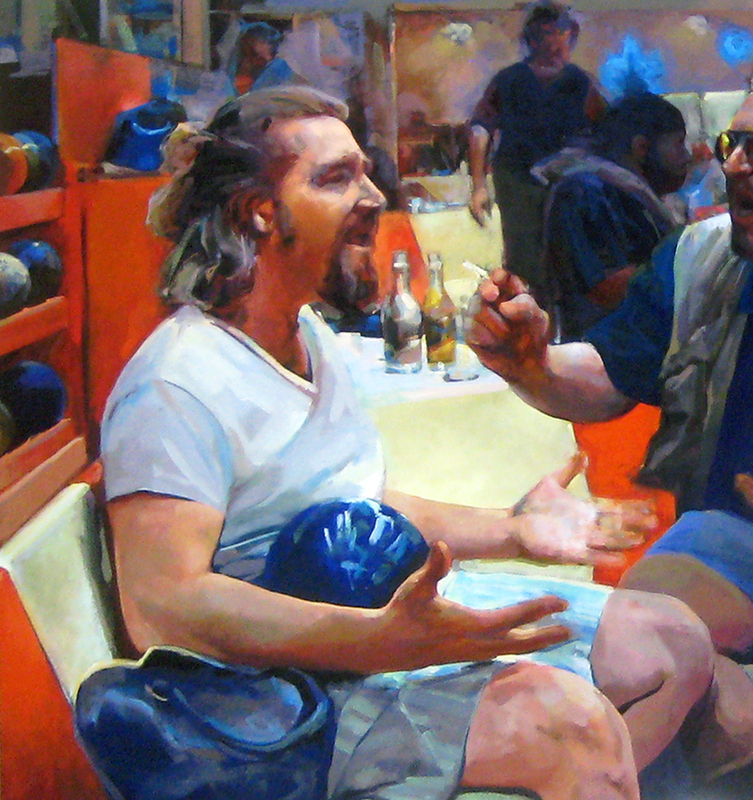 This entry was posted in Uncategorized and tagged Best Actor, Coen Brothers, contemporary, Crazy Heart, figurative painting, Jacques-Louis David, Jeff Bridges, narrative painting, neoclassical, Oscar, The Big Lebowski, The Dude, The Oath of the Horatii, • The Lebowski Cycle on March 8, 2010 by Joe Forkan. The Death of Marat (After David) • Joe Forkan 2008, oil on linen, 96" x 58"
I tried to come at this painting from many different directions. 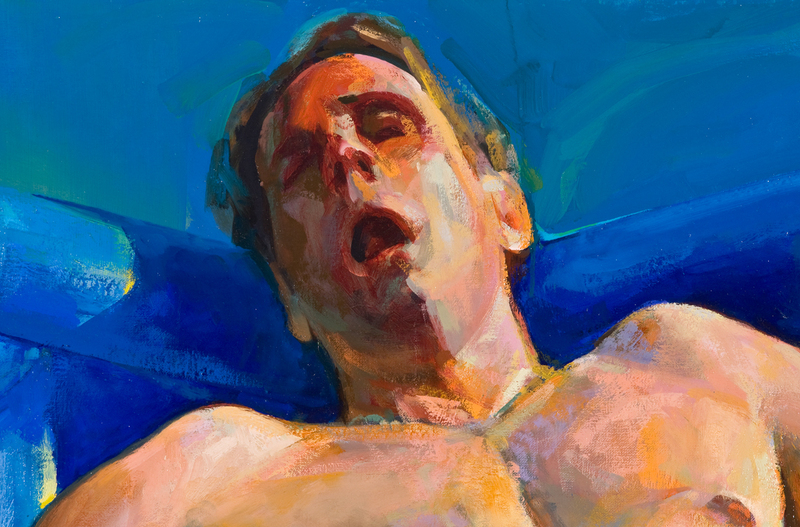 I had been thinking about the tension between figuration and abstraction in painting method and painting movements, particularly the many different directions in painting since the Neoclassical period, when David was working. David used his paintings to extol the virtue’s of the state. 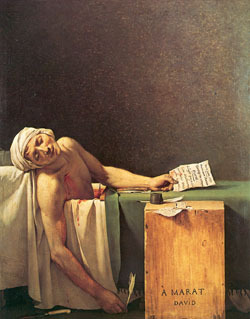 The Death of Marat was essentially a political document from the French revolution. “David was active in numerous agencies of the reign of terror, and historians have identified more than 300 victims for whom David signed execution orders” (source). The idea of a contemporary artist signing execution orders for the state fortunately seems quite odd and extremely unlikely. Abstract and minimalist works are a departure from the depiction of reality by way of representational imagery and are often considered apolitical. I was thinking very much about the collision of those styles and ideologies as I painted this, and was drawn to de Kooning’s Excavation and the work of Brice Marden. A recurring joke in The Big Lebowski is that Uli (the man floating in the pool) is a nihilist. -”He doesn’t care about anything”. “That must be exhausting,” Lebowski replies. 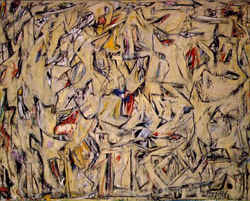 This entry was posted in Uncategorized and tagged abstraction, Brice Marden, contemporary, figurative painting, french revolution, Jacques-Louis David, Joe Forkan, minimalism, neoclassical, nihilism, reign of terror, The Big Lebowski, The Death of Marat, Willem de Kooning, • The Lebowski Cycle on February 10, 2010 by Joe Forkan. 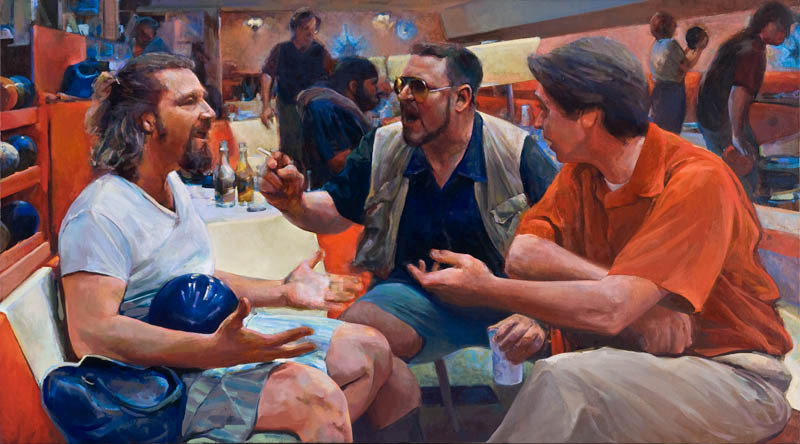 Begun in 2006, The Lebowski Cycle is a series of paintings exploring the idea of layered narratives, using masterpieces of western art and the 1998 Coen Brothers’ film The Big Lebowski as a starting point. Much of my previous work is figurative, dealing with memory and perception, and walks a line between representation and abstraction, but still I struggled with the idea of making narrative paintings. 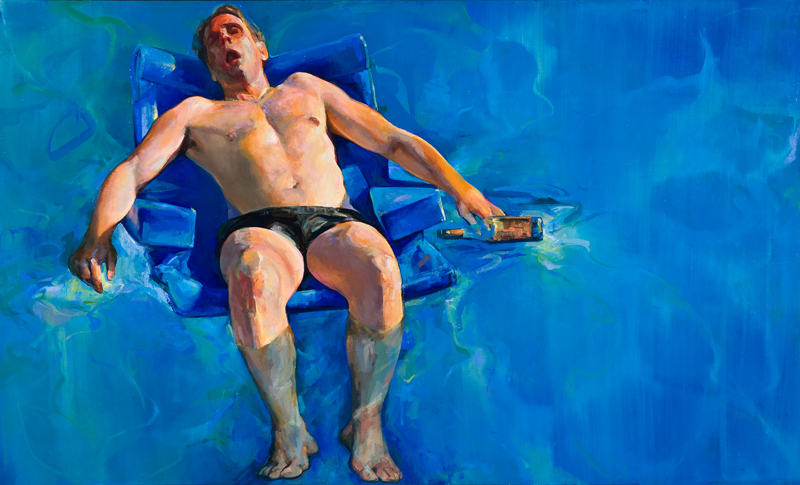 Film and television have largely overtaken painting as the mediums for narrative approaches, and contemporary painters have largely focused their attentions elsewhere. Yet I have still found myself moved by paintings that depicted grand story arcs, compressing into a singular image a multitude of thoughts, ideas and emotions. And it wasn’t strictly the stories that interested me. Actually, when looking at narrative art from the Baroque era in particular, I am often more interested in the internal complexities of the images than the specifics of the story represented. The human interaction and conflicts, the formal qualities and modes of depiction give the paintings great breadth and depth and can continue to engage the viewer’s interest over time. These were challenges I wanted to engage in my work. The formal and conceptual possibilities seemed enormous, but only if the narratives could remain mobile, and the paintings weren’t trapped in a singular reading. I began thinking about The Big Lebowski, the 1998 film by Joel and Ethan Coen. In writing the film, the Coen brothers began by constructing of a labyrinthine narrative worthy of a Raymond Chandler novel, and replaced the traditional hardboiled detective character with an aging pothead, turning a genre on its head. This gave them great storytelling possibilities, playing off of and to the conventions of the genre (as well as the conventional take on aging potheads). I’ve always loved this film for its humor, its preposterous story arc, rich visuals, and the way the entire story is played so absolutely straight by the actors. The film became a screen upon which I could project ideas from a wide range of sources and intensions. By combining narratives, themes, and titles from well-known works of western art with scenes from the film, and ideas and approaches from contemporary art, I found a rich repository of images that informed, overlapped and contradicted each other; ideas to alter, splice together, reconfigure, and run back through the language of painting. It’s an engaging process. 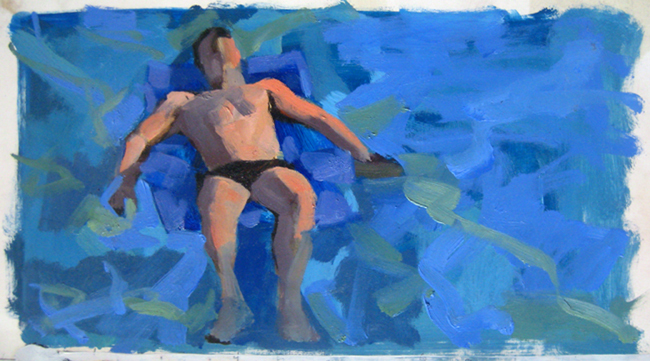 Each painting of the original twelve is at least 72 x 40 inches, painted with oil on linen. My desire was to have the paintings read as a body of work, and I knew that the paintings would diverge stylistically if painted sequentially, so I decided to begin all twelve of the original paintings at once. Four are now completed, the other eight are about 90-95% completed. 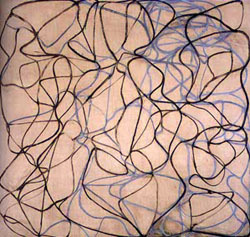 This entry was posted in Figurative Painting & Drawing, The Lebowski Cycle and tagged Baroque painting, Brice Marden, Coen Brothers, contemporary, figurative painting, Jacques-Louis David, narrative painting, painting, process, Raymond Chandler, The Big Lebowski, The Death of Marat, Willem de Kooning, • The Lebowski Cycle on November 20, 2009 by Joe Forkan.